Or view larger version. 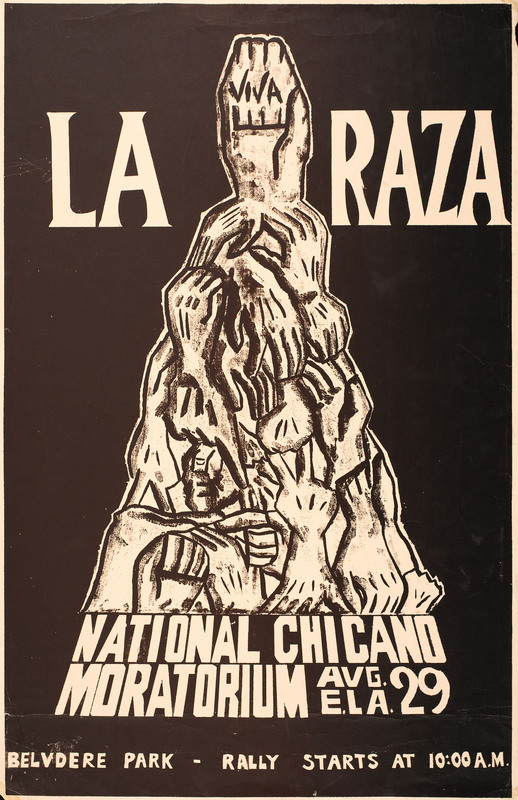 Viva la raza : National Chicano Moratorium : Aug[August] 29 E[East] L.A. 1970. Unknown artist. Poster. Collection of Oakland Museum of California, All of Us or None Archive. Gift of the Rossman Family. A mass of interlocked hands forms a pyramid, classic symbol of Mexican heritage. By the late 1960s communities of color were actively opposing the Viet Nam war, and a series of national demonstrations at more than 20 cities by Chicano and Latino activists were organized for August 29, 1970. The Los Angeles rally drew tens of thousands. Massive police presence resulted in a clash that left many tear gassed and beaten, as well as the death of award-winning Chicano journalist Rubén Salazar.